“I want to write stories so the readers will like mankind a little bit more,” says Israeli writer Etgar Keret in the documentary Etgar Keret: Based on a True Story. 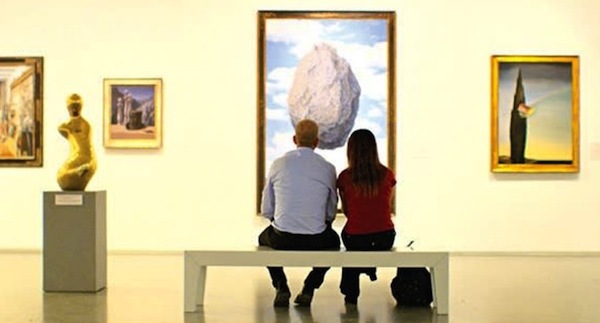 Similarly, as depicted in another film, the Israel Museum aims to uplift and educate visitors with its artistic, cultural and historical displays, and The Museum offers a glimpse into the breadth of its collections and the diversity (and quirkiness) of its employees. Both of these award-winning films screen during the Vancouver Jewish Film Festival, which started this week. Danish filmmakers Stephane Kaas (director) and Rutger Lemm (writer) do an excellent job of introducing viewers to what makes Keret tick. They do so using a creative mix of interviews with Keret and his family, friends and colleagues; reenactments of sorts of a few key points in Keret’s life; and a few of Keret’s stories, the portrayal of which is mainly done in animation. Not surprisingly for anyone who has read Keret’s short stories, there are several laugh-out-loud moments in Etgar Keret: Based on a True Story, but there are also sombre elements, as we learn about how Keret has been impacted by tragedy, including the suicide of one of his best friends. While many of Keret’s stories have gloomy aspects to them, the stories as a whole generally leave readers feeling good. He describes his stories as “an advertisement for life,” saying that he writes to answer the question of why he wants to live. “I think the need to tell stories is, basically, the need to put a structure to the reality around you. And I feel that the more chaotic and the less sense it makes, the stronger the need I have to tell a story about it,” he explains in the film. The opening of Ran Tal’s documentary The Museum grabs viewers’ attention: a black screen, the sound of footsteps, some shuffling about, then a woman asks a man, “What do we have?” “That’s a huge painting,” he begins. When the scene is revealed, we see the man and woman sitting on a bench, looking at the painting, but the woman seeing it only through his eyes, as she is blind. Later in the film, this woman is part of a group of blind people visiting the museum – she and others touch various sculptures, feeling how the works are made. Admittedly, The Museum only touches upon more serious concerns – there is a scene where a group of museum staff discusses a collection of traditional Palestinian clothing that is in storage, and the potential impacts of displaying (and not displaying) them – but it at least does bring up such issues, which will hopefully open the door for more in-depth discussion. The Museum screens on Nov. 17, 6:45 p.m., at the Rothstein Theatre. For the full festival schedule and tickets, visit vjff.org. When I read and valued the unique style and flavour of Boris Sandler’s story “Studies in Solfege,” in Ezra Glinter’s anthology of short stories, Have I Got a Story for You, gathered from the Yiddish Forward, I wondered if there were any other fictions available in English by this talented, inventive writer. It was heartening and encouraging to see that, in the parentheses where age is given, there was no other number besides his year of birth. To my delight, I soon learned that Syracuse University Press was planning to issue Red Shoes for Rachel. In talking about Yiddish writers, we usually are dealing with those long gone, like Sholem Aleichem, I.L. Peretz, Avraham Reisen or Chaim Grade – it is a distinct pleasure to review a book by a living Yiddish writer. In Red Shoes for Rachel, we meet Sandler’s fellow Jews from Bessarabia. During the Second World War, the Jews there suffered under the Germans and the pro-German Romanian fascists. But then, soon after being liberated by the Red Army, they fell under the rule of rigorous Soviet dictatorship. In these three novellas, we meet perceptively drawn men, women and children as they live their bumpy lives and dream their hopes in the Soviet Union, in Israel and in the goldeneh medineh (golden land), Brooklyn, more specifically, Brighton Beach. Sandler’s style, unlike that of most other writers in the Yiddish literary canon – almost all of whom write in the late 19th-, early-20th-century realistic style – hovers between realism and magic realism (think of writers like Jorge Luis Borges, Italo Calvino and Mario Vargas Llosa) with surprising effect. Time zones elide. Scenes shift, via recall, from years past to the present. Arching over this are believable, vibrant human beings who are vivified through description, dialogue and interior monologue. From the first line of “Karolina-Bugaz” – “Bella woke from sleep as if she had been driven out of it” – one sees at once a writer who uses his tools – words – with verve and imagination. On the 30th anniversary of her marriage, Bella goes to a bakery to pick up a special cake she has ordered. But she comes home to find a note that her husband, Mark, has left her. He is now on a cruise, alone, and, on an island near where the ship has docked, he meets a young woman who has the same name as his wife. In realism, a reader knows where he is, and which character is breathing in his presence. In magic realism, the borders between true and make believe are blurred and the reader is never really sure. Reality in such fiction is a slippery slope. In the beginning of “Halfway Down the Road Back to You,” we see an 80-year-old woman in Israel preparing dozens of slices of dried white bread, which are scattered all over her apartment – she considers this an obligatory present when visiting. The woman had spent 73 of her years in Beltsy, Bessarabia. For the past seven, she has lived in her small apartment in Nazareth, where there is a windowless security room stored with food, “just in case.” Both her children are abroad; there is no indication she has any friends, except for a twice-a-week aide. Via memories, we relive her days in the Romanian ghetto during the Second World War, where she risked being shot by slipping out once in awhile to beg for food for her family. It is only toward the end of the tale that we suspect she might be bringing all those crusts she has prepared into that security room, though we can’t be sure. Red Shoes for Rachel contains one of the most beautiful and moving stories of middle-aged love I’ve ever read. Rachel, the only American-born protagonist in the collection, lives near the Coney Island boardwalk and selflessly tends to her wheelchair-bound mother. One day, when she bumps into Yasha, a divorced immigrant from Moldavia, her life turns around and achieves a spark. In separate chapters, we learn of Yasha’s Holocaust experiences and also those of Rachel’s parents. With delicacy and warmth, the relationship develops. By the end, the two lonely souls have formed a bond. Occasionally, in translations of Yiddish literature, there is a wide gap between knowledge of Yiddish and knowledge of Yiddishkeit (Judaism), with errors regarding some obvious points in the latter. One story depicts “a Sabbath lunch with songs and putting on of phylacteries” (tefillin), which is done during morning prayers on weekdays and certainly not during lunch. Another has a mistranslation of the Hebrew/Yiddish exclamation, “Borukh Hashem,” which does not mean, “blessed be His name,” but “blessed be God” or, actually, “thank God.” Elsewhere, a woman “blesses the Sabbath candles.” Jewish women do not bless objects and, in this case, would recite a blessing to God over the candles. These comments aside, Barnet Zumoff’s translation is splendid, natural and effortless. It meets the gold standard of translation – reading this book one assumes the stories in it were written in English. Read Red Shoes for Rachel and you will discover a superb storyteller, a modern master of prose. Curt Leviant’s most recent books are the critically acclaimed novels King of Yiddish and Kafka’s Son.